More Dolls With Disabilities By Mainstream Toymakers Hitting Store Shelves : Shots - Health News Longtime toymakers are broadening their horizons — offering dolls and other figures with hearing aids, wheelchairs and insulin pumps in city scenes, not just hospitals. That's a start, activists say. Dominika Tamley and her doll "Isebelle" ride the train together in Chicago. Like Dominika, Isebelle has a hearing aid. "She's like a mini-me," Dominika says. 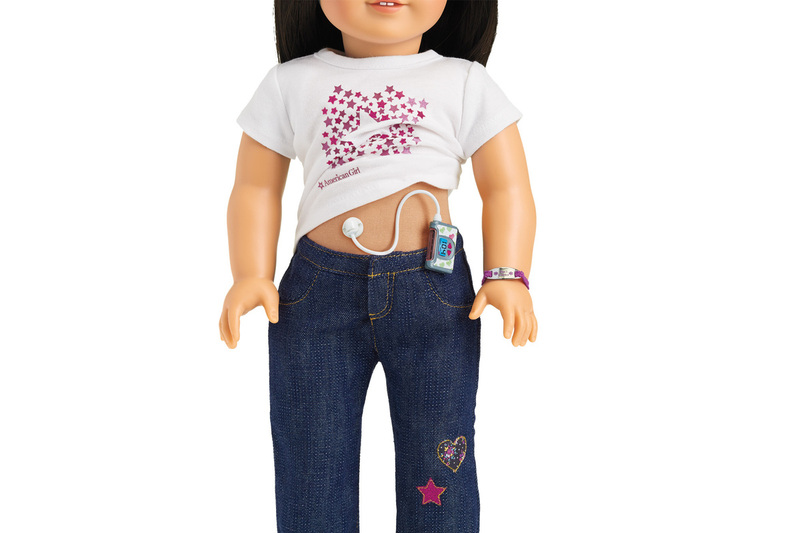 "The designer who worked on that had Type 1 diabetes, and it was a really personal item for him to create," said Stephanie Spanos, a public relations manager at American Girl. The designers developed the diabetes kit with the input of doctors, nurses and dietitians at American Family Children's Hospital in Madison, Wis., Spanos added. "We introduced that at the very beginning of 2016 and it's been in and out of stock all year." The "Diabetes Care Kit," designed to fit American Girl dolls, comes with insulin pumps, pens, glucose tablets and a blood sugar monitor. Still, more and more mainstream companies are adding characters with disabilities to their roster of toys. 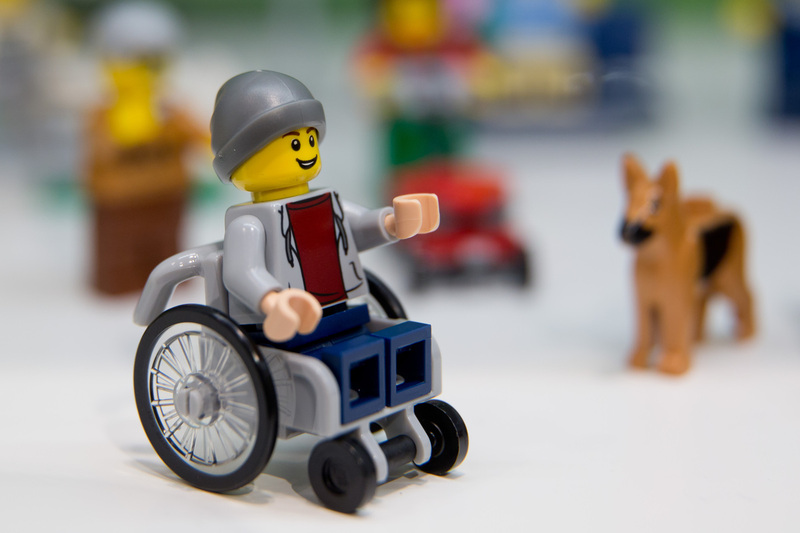 Earlier this year, Lego introduced, for the first time, a figure of a little boy in a wheelchair. Significantly, he's not in the hospital — instead, he's part of a city park set, representing people with disabilities out in the world. And in 2013, Toys R Us added its Journey Girls line of dolls, with accessories including wheelchairs and crutches. Is this good business? Or just good public relations? "It's not about PR for us," said the chief merchandising officer of Toys R Us, Richard Barry. "Our job as a company is to make sure we have the best assortment for all kids." Barry pointed out that Toys R Us catalog has also started including children with disabilities in its photos of kids playing with the company's toys. Representation of kids with disabilities was harder to find at a big-box store in the suburbs of Washington D.C., where Rebecca Cokley took me shopping. Cokley is executive director of the National Council on Disability, and the first female little person to have worked in the White House. She's 4 feet 2 inches tall and white, with red hair and freckles. "My family is interracial and interspatial," she said. "My husband's average height and African American. And, so, our kids are biracial dwarf kids." There were all kinds of toys Cokely liked in the aisles — she's a Lego nerd and a big fan of Batgirl, a character with her own deep connection to the disability community. But it was nearly impossible to find a single toy that represented disability. In the Barbie aisle, we found chef Barbies, vet Barbies and gymnast Barbies. A Lego figure in a wheelchair was introduced at the 67th International Toy Fair in January 2016. He comes in the "City" set, a community of figures shown playing and working in an urban park setting. "And look — there's Barbie's inaccessible dream house!" Cokely said. "It's got a working garage, but the elevator is too small for a wheelchair." It would be tough for Becky to come over for a visit. We had more luck in the Star Wars aisle. Cokely noticed a Luke Skywalker doll that comes with a prosthetic arm. "That counts!" she exclaimed, with a wry aside: "People do tend to claim Vader, but I don't know if that's a good thing or a bad thing." Aside from Luke, only one other toy (among many hundreds) explicitly represented a disability: Nemo. The friendly orange clownfish from the Pixar movie has one shortened fin, and the store sold a stuffed plush version. "Both Finding Nemo and Finding Dory have been phenomenal resources for parents with disabilities," she said. "Not only in terms of showing good examples of kids with disabilities, but also the challenges of being that overprotective helicopter parent." She pointed out that some toys – such as My Little Pony — have been embraced by some disability activists, but that so much of the toy section represented missed opportunities. "Why don't we have any GI Joes that are disabled vets?" Cokely asked. "Think about that, what that would mean to a young boy whose dad's a vet or whose mom's a vet. To see their parents' experience reflected in the toys — that would be massive." Research by social psychologist Sian Jones of Goldsmith University of London, as well as that of others, shows that all children benefit from playing with toys representing disability — it heightens empathy. And activist Rebecca Atkinson, who runs the Toy Like Me website in the United Kingdom, told me she'd love it if every toybox included a wheelchair and a seeing-eye dog for children to play with. (Atkinson's website points consumers towards toys that represent disability, and also creates playful images meant to inspire manufacturers, such as princesses with eye patches and scars, and superheros with tracheostomies. This isn't a niche market, Cokely added. One in four people will experience a disability at some point in their lives. "Everyone has a family member with a disability," she said. "Everyone knows someone with a disability." And playing with toys in an imagined world where, just like in real life, people walk or use wheelchairs or have hearing aids is a world where kids can imagine other kids — disabled and otherwise — as friends. A caption on a previous version of this story misidentified the city in which Dominika Tamley was riding a train. She was in Chicago, not in Washington, D.C.